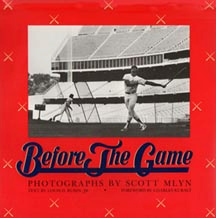 BEFORE THE GAME Photographs by Scott Mlyn, Foreword by Charles Kuralt, Text by Louis D. Rubin, Jr. The lives of the players and the spirit of the game are seldom more in evidence than before the umpire yells “Play Ball.” Those precious moments have been captured by photographer Scott Mlyn in Before the Game, a book that goes to the very core of baseball. This lovely collection of pictures isolates those long, languid hours before the cheering starts. In the clubhouse, behind the batting cage and up in the stands, photographer Mlyn finds those baseball moments that contain essences. The photographs are beautiful. There is an inwardness to this book about baseball which I really love. Slow and meditative…but mixed with the gaiety. How I love the photographs of laughter. I have not yet read Rubin but I have dwelt on your photographs. This book of photographs by Scott Mlyn captures the game’s special charm and allure and suggests why baseball is the subject of so much literary attention. A unique atmosphere captured by Scott Mlyn and Louis Rubin. Photo essays on baseball have been around almost as long as the game itself, but this one takes a refreshing new tack. It would be difficult to miss the point after viewing Mlyn’s striking black and white photos. In a season rife with good baseball books, this tranquil, contemplative little volume just may be the one with the most impact. Many of these photos are wonderful, some of them are superb. Thanks to Mlyn and his well-traveled camera, we are treated to an inside look at America’s favorite pastime. The photos are among the finest I’ve ever seen in a sports book. I can’t say enough about the photos – they’re terrific. Super stuff. An enticing look at pre-game rituals on and off the field—evokes the magical pull of baseball for its myriad fans.